Mounting axles in blocks with slots has always been problematic. Problems include damage to the car body, sore thumbs, non-symmetrical insertion (some axles angled, others not), bent axles, and uneven car-to-wheel gapping. I believe there is an easier way, so today’s article will provide a game plan for both simplifying axle insertion and improving accuracy. Whether your block is equipped with axle slots or axle holes, preparation is necessary to simplify and ensure proper axle installation. This preparation should occur before any other work is done on the wood block. Axle Method – One way to widen the slot is to use a hammer to tap a spare axle into the slot, pull it out with a pair of pliers, and then repeat for the other three positions. While this will work, it is not particularly accurate and can lead to block damage. Pro-Body Tool Method – The preferred method to widen the slot is to use a Pro-Body Tool.1 The Pro-Body Tool is a drilling guide, with which a drill bit is used to accurately widen the slot. It will also compensate for slots that are slightly out of square. Click Here to get a better idea as to how the Pro-Body Tool works. Axle HolesSimilar to axle slots, in order to firmly hold the axles in place, axle holes are generally drilled smaller than the diameter of the axle. In addition, pine tends to ‘relax’ after it is drilled, so the final hole will tend to be slightly smaller than the drill bit. To open up the hole, tap a spare axle into the hold, pull it out with a pair of pliers, and repeat for the other three positions. Axles can be inserted by a variety of methods including pressing them in by hand, or pressing them in place with a vise or clamp. Regardless of the method, the gap must then be set between the car body and the wheel hub. The PineCar alignment tool can be used for setting this gap, or you can use a dime. The Pro-Axle Guide is a tool to help insert axles with accuracy. 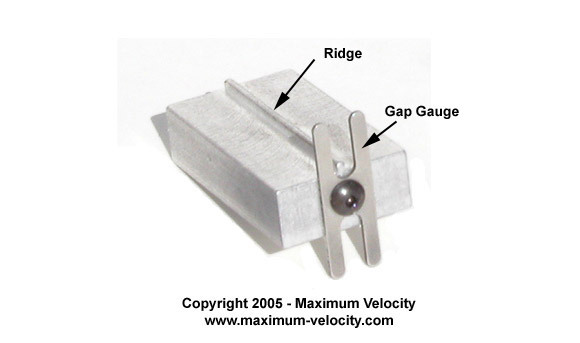 The tool is equipped with a ridge to keep the axle at the correct depth in the slot, and is also equipped with a gauge for setting the proper gap between the car body and the wheel hub (see Figure 1). Partially insert the axle into the slot/hole, and then place the tool on the bottom of the block with the gauge between the wheel and the car body. Next place the axle head on a hard surface, such as a workbench or desk. While firmly squeezing the tool to the block, press down on the axle head. Continue pressing until the wheel hub rests against the gauge. For non-BSA wheels, the axle will need to be inserted a bit further. 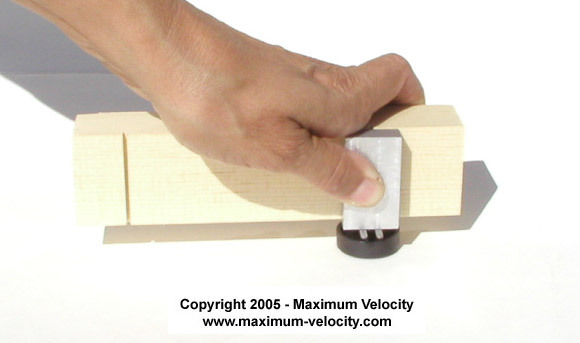 This can be done by pressing the axle head with a thumb or the handle of a small screwdriver. Remove the tool and repeat for the other axles. Now that the wheels/axles are installed, but before they are permanently affixed, test and adjust the alignment of the car. To accomplish this, you may need to remove and reinstall the axles. If so, then repeat the process described in the previous step. If you are unsure as to how to align the car, there will be an article on alignment in a future newsletter, or you can find two documented procedures in our “Speed to the Finish” booklet. Finally, the axles must be secured in place. The method is different for axles slots versus axle holes. It is not runny (like superglue), so it won’t sneak into the wheel bore and lock up the wheel. To glue the axles, lay the car on soft rag with the bottom facing upwards. 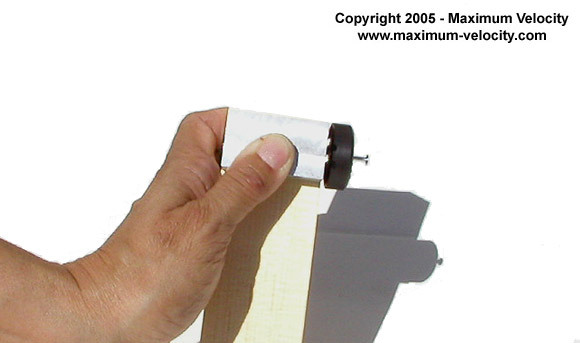 Place a dab of white glue in the slot area between the axle tips. Spread the glue over the top of the axles, but keep it away from the wheels. Remove excess glue with a rag, and then don’t move the car until the glue is dry. Again, I prefer white glue for the same reasons listed above. Proper axle installation is extremely important to reach maximum velocity. I hope that you find the information in this article to be helpful, and that you have a successful race this year. 1The Pro-Body Tool can be found by Clicking Here. 2“Speed to the Finish” can be found by Clicking Here. 3The Pro-Axle Guide can be found by Clicking Here. Here is my daughter’s last official Awana entry. She will be too old to race in the Awana competition next year. She did everything on this car except truing the wheels, molding the lead and cutting the block on the band saw. We had a great time building this one. She actually would come up and tell me it was time to go down to the basement and work on it. She got 1st Place for speed and 1st Place for original design. It was a great way to end our competition (onto the open classes). She loves to play soccer, but will miss one game as the state Grand Prix is on the same day. 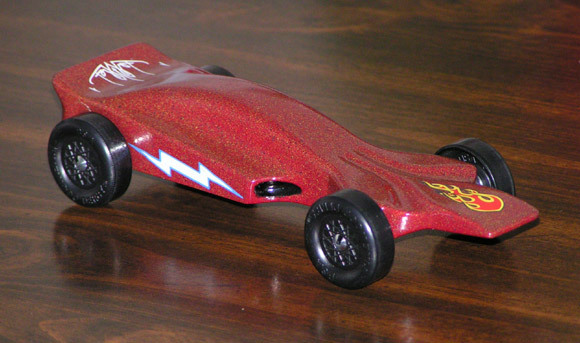 Here is a picture of the cars my son and I did a few years back for one of our Royal Ranger derbies. We both decided that we were getting tired of making the same type of cars and went with these different cars. 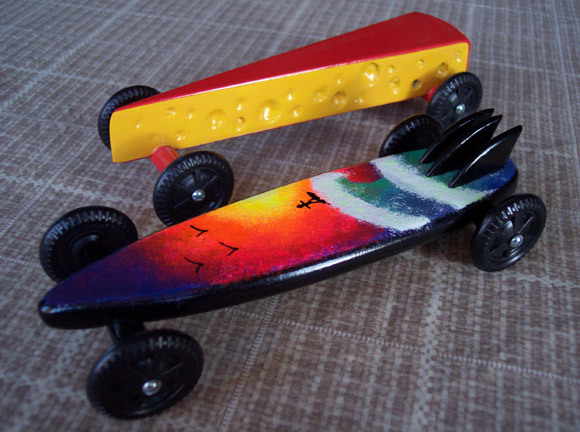 The cheese block was my car and the surf board was my son’s idea. He was a little young at the time so I had to help him implement the idea. Back then we raced at 6 ounces instead of 5 like we do now. You wouldn’t believe how hard it was to get 6 ounces in that thin little surf board – there’s more lead than wood! Here is a picture of my grandson’s (Zack) 1st Place winner (den, pack, and district). We raced on a 45 foot aluminum track, with MPH used to determine the winners. We did it in 8.243 MPH. Zack is a first year Webelo, so we have two more cars to make. Our son started his Cub Scouting career late, so he didn’t do his first pinewood derby until he was a Bear. Remembering the one pathetic race I participated in when I was a Cub, I did lots of research into the ‘tricks of the trade’. I learned about matching the wheels, sanding and polishing, axle positioning, weight distribution, etc. I also looked for car designs and templates, printed these, and let my son choose his car. We spent the next month putting all of these lessons learned into effect. There was much cutting, sanding, polishing, sanding, polishing, and then more sanding. We got down to a week before the big race, and it was time to paint. With our son being a big Harry Potter fan, he wanted a ‘Snitch’ car, so we painted the car a metallic gold. Mom then got in on the act and hand-painted wings on the side, a lightning bolt on the nose, and the ‘HP’ logo on the rear end of the top. A trip to the Post Office revealed I was still light on weight, so I added one flat piece of weight to the end, painted it with the gold, and we were set. Our son is highly competitive, so we spent the morning of the race talking with him about being a good sport regardless of the results. His best friend was the two-time defending Pack Champion, so we thought we’d have a hard time placing, and wanted our boy to be emotionally prepared. Turns out we were wasting our breath. The first heat our son was in, he got himself positioned right at the end of the track. As the cars left the starting gate, it was clear we’d done something right. His car had a two car-length lead coming out of the curve, and extended it on the flat. He was absolutely ecstatic as his car won his first ever race. On his second heat, with his friend in an adjacent lane, he ‘took the flag’ by two car-lengths. He faced a real challenge in the third heat, coming off the curve half a car-length behind. However, he shot past all the cars on the flat to win by a full length. End result – Den and Pack Champion, with a big trophy to prove it!!! I’m glad I had the DVD camera to capture all of the excitement. The District race was held a month later. In the Bear rank preliminaries, our son took third out of 45 participants, qualifying for the District finals. There was a significant break between our rank qualifying and the finals, so I took the car and we went to lunch. It was at this point I probably made a mistake. During the lunch break I added more graphite to the wheels and axles. While I spun them in, I’m still wondering if it was a mistake. In the finals, we never came close. We ended up finishing ninth out of 15 in the finals. Disappointing for our son, but not bad for a first-ever racer. I understand the reason to run with one wheel off of the track but which wheel should you raise? I recommend lifting a front wheel and offsetting the added weight towards the rear of the car. Left or right doesn’t really matter, but I always lift the left-front wheel (probably because I am right-handed!). Our pack is considering buying a new track to host the District races. We’re thinking about an aluminum track with at least 6 lanes. But, we see there are several lengths of tracks available. We run in a school gym, and that gives us plenty of room. Is there a large difference in performance/speed between tracks that are 32′, 40′ or 48′? Does one length favor a certain type of car over another length? 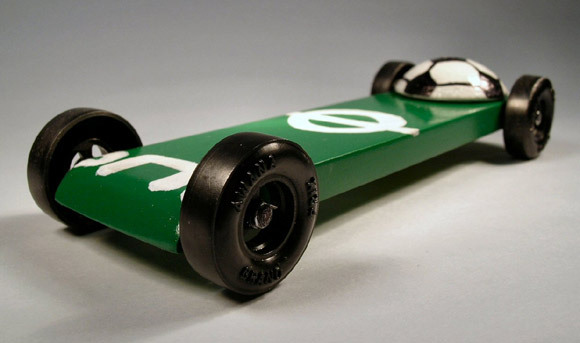 Would you expect cars that work well on a Pack’s wood track to do equally well on an aluminum track? Longer tracks provide more room for spectators. Longer tracks make the races a bit longer which may be more interesting. Longer tracks are more expensive. Longer tracks take more space to store, and a little longer to set up accurately. Longer tracks result in more cars failing to reach the finish line (probably won’t happen at the district level). Longer tracks can lengthen the overall event as it takes longer to retrieve cars. The performance difference is in the order of a few tenths of a second per every 8 additional feet. Assuming that the tracks being compared have the same geometry (slope followed by a long flat), the shorter tracks (under 40) strongly favor a rear weighted car. As the track lengthens, best results are obtained by adjusting the balance point forward in proportion to the track length. If you have a 32 foot track at the pack race, and then a 48 foot or longer track at the districts, you may get different results (i.e., the finishers from a particular pack may finish in a different order). There could be fairness issues if some packs impound cars and other packs don’t. The people that have access to their car between the events could adjust the weight position slightly to optimize for the longer track. We are thinking of using a Body Skin for our car. If we apply a Body Skin can we then apply dry transfer decals over the Body Skin, or will there be adhesion problems? Dry transfer decals can be applied to the Body Skins. Just make sure the Body Skin is fully dry before applying the decal.